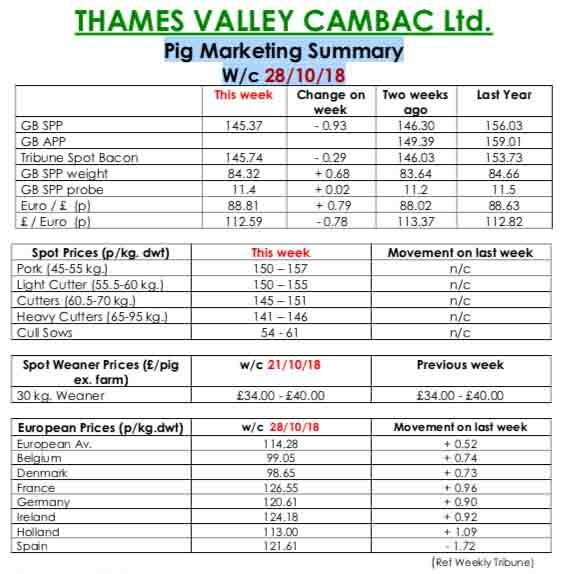 This week’s Pig Marketing Summary from Thames Valley Cambac said thetrading week was not without issues as factory reliability stuttered but improved. Most processors took their committed contract number, but there was little spark in trade. It is a worry that trade is so quiet at this time of year, when processors should be putting down product in advance of Christmas. Contract price contributions mostly stood on, with some monthly quotes down significantly. The fresh meat market was steady with many butchers hoping for a change in fortunes at the month end. Demand from the fresh meat market remained poor, with competition from imports in evidence in many parts of the country. The cull sow market moved up a penny based on currency, indicating some welcome stability on the continent. In Europe, the only major mover was Spain which lost another 3 euro cents, to bring that market closer in line to its near neighbours. All quotes in sterling were enhanced, however by a stronger Euro that ended the week up 0.38p at 88.02. The Weaner Marketing Summary, for week commencing October 21, reported that the market was extremely difficult for any supplies outside the comfort of a contract. One off offers from breeder feeders found little interest, with fatteners keeping a very tight reign on intakes. 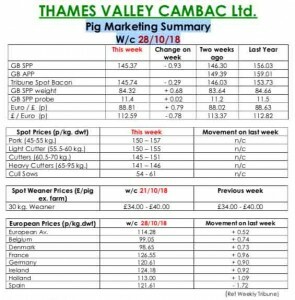 The prices announced by the AHDB saw the weighted average for a 30kgs pig fall by £4.62 to £47.54 and the weighted average for a 7kg fall by 63p to £36.92.